"I repaint other people's paintings. See that there? That's 'Bailed up'. You know, Tom Roberts. I've just taken the figures out and repainted the background." One of Williams' greatest works, 'My garden' was painted in direct response to Tom Roberts' 'Bailed up', underlining Williams' strong allegiance to the Heidelberg School and especially to Tom Roberts, the Australian painter he loved most of all. In a singularly profound homage from one artist to another, Williams transmuted the golden glare of a relatively gentle New England landscape into his own painterly expression of the hot red heart of the continent; acting out his long-held declaration that 'Bailed up' was the most important landscape painting in this country. Signed bot.c., black oil "Fred Williams". Not dated. Art Gallery of New South Wales Annual Report 2000 , 'Year in review', pg. 8-20, Sydney, 2000, 8, 9 (colour illus.). Art Gallery of New South Wales: highlights from the collection , Sydney, 2008, 102 (colour illus.). Betty Churcher, Australian notebooks , 'Art Gallery of New South Wales', pg. 45-90, Melbourne, 2014, 52, 53 (colour illus. ), 254, 255. David Hansen, Australian Impressionism , 'National Naturalism', pg. 281-287, Melbourne, 2007, 281, 282 (colour illus.). Deborah Hart, Fred Williams: infinite horizons , 'Dialogues across series', pg. 80-89, Canberra, 2011, 81, 82, 83 (colour illus. ), 209, 227. Hendrik Kolenberg, Look , 'Celebrating Fred Williams', pg. 24-25, Sydney, Nov 2004, 24. Patrick McCaughey., Age , 'A painter apart', Melbourne, 27 Sep 1967, page unknown. Art of Australia. Vol 1: Exploration to Federation , ‘Individual and national feeling’, pg. 545-610, Sydney, 2008, 582 (colour illus. ), 583. 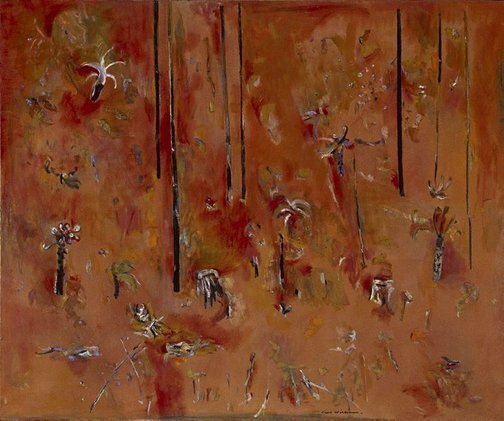 A singular vision: the art of Fred Williams , 'Painting in the Dandenongs: The Upwey and Lysterfield Series', pg. 86-113, Canberra, 1989, 86 (colour illus. ), 87, 89, 91, 158, 253. Barry Pearce, Look: 1953-2003 celebrating 50 years , 'Presenting our own artists: how the AGS put balance into the Australian collection', pg. 42-44, Sydney, May 2003, 44 (colour illus.). Barry Pearce, The Weekend Australian , 'Time makes its judgment', pg. 2-3, Sydney, 12 Aug 2000-13 Aug 2000, 3 (colour illus.). This colour supplement is a 'Review Special' published for the 'Weekend Australian'. It consists of a four-page, colour wrap-around for the 'Weekend Australian Review'. 'The Australian' was the media sponsor for the AGNSW Exhibition 'Australian Icons', for the Olympic Arts Festival 2000. 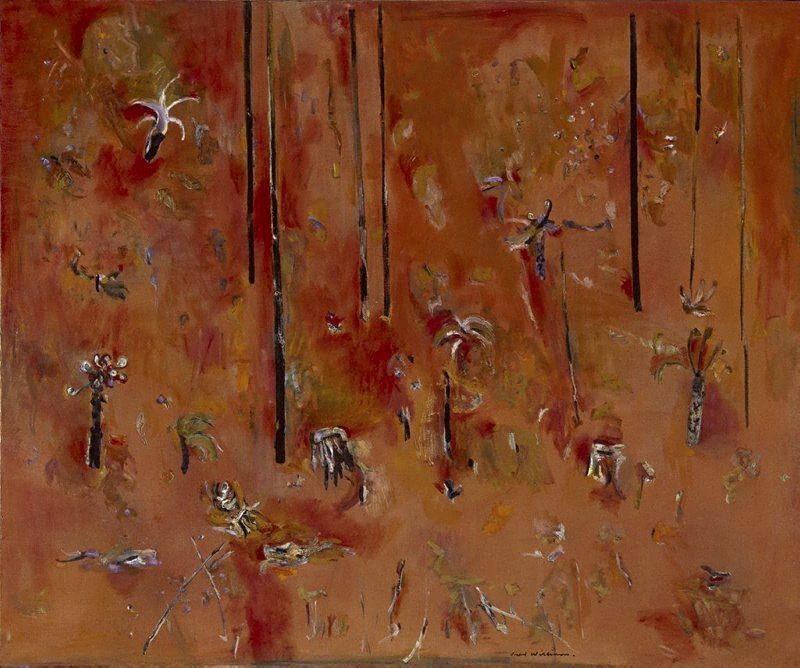 Barry Pearce, Australian art: in the Art Gallery of New South Wales , 'Introduction', pg. 10-16, Sydney, 2000, 11 (colour illus. ), 16, 302. John Saxby (Editor), Look , 'Member profile: Pam Menzies', pg. 10, Sydney, Jul 2016, 10 (colour illus.). John Saxby, Look , 'Farewell Judith', pg. 56, Sydney, Dec 2015-Jan 2016, 56. Judith White, Look , 'An artist's homage', pg.18-20, Melbourne, Feb 2000, cover (colour illus. ), 5 (colour illus. ), 18 (colour illus. ), 19, 20. Judith White, Look , 'A generous gift', pg. 13, Sydney, Oct 2007, 13 (colour illus.). Unknown, In the making , Australia, 1969, 103 (colour illus. ), 102-107.